My mind is on the farmers in New Mexico this morning, dealing with the aftermath of Winter Storm Goliath. One article I read estimated that 5% of the dairy cows in New Mexico were killed by the storm. Five percent doesn’t sound like a lot. But there were around 150 farms affected. Many of those farms were forced to dump their milk when trucks were unable to reach them. Dairy farms do not have long-term milk storage – they depend on a regular schedule to transport their milk from the farm. Two days of milk, literally down the drain. The media coverage in events like this usually focuses on the financial fall-out. How much were the cows worth? How much production was lost because of the storm? How much was the dumped milk worth? 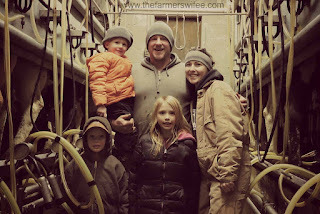 The Stauffer Family, dairy farmers in Washington. But for the farmers, the impact is so, so much more than financial. That fact became very apparent to us when we were living in daily fear of bird flu last spring. The financial aspect is scary – no doubt about that. Farming is a risky business and there’s a huge capital investment that makes today’s farms run. With tight profit margins, one disaster can be enough to ruin a farm that’s been in the family for generations. Generations… more than 90% of the farms in the US are family farms. Even the big farms are family farms. And most of those have been in the family for generations. It is more than a business, more than profit and loss. It’s a family heritage, and the work of our ancestors has given our generation of farmers an opportunity to continue the way of life we hold so dear. 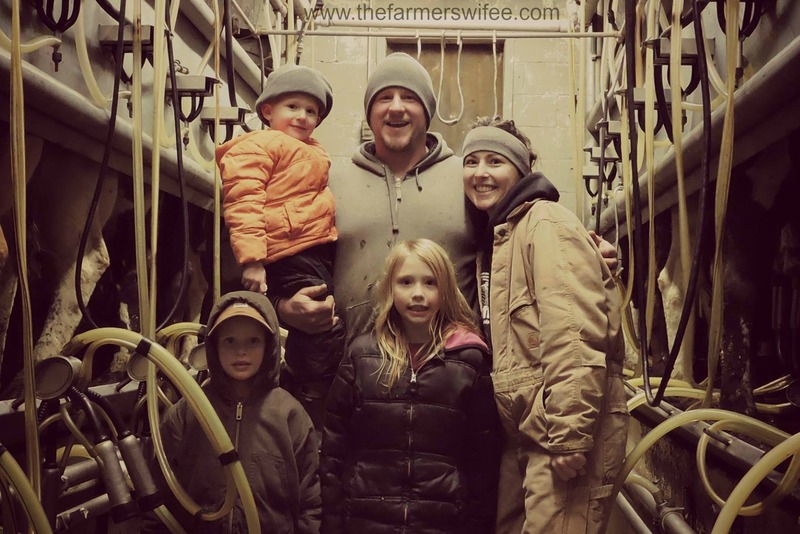 For many of us, our ultimate goal is that the next generation can come back to the farm if they want. We are merely temporary guardians, responsible for the farm for a relatively short time in its history. And we feel that it is our duty to honor the generations before us and prepare for the generations to come. Krista, The Farmer's Wifee, and a calf. It is a great responsibility. And it weighs on our shoulders. Add to that the connection farmers feel to their livestock, and the stress multiplies. Livestock like dairy cows are not pets. But they are living creatures, and farmers work hard to care for them. When those animals suffer, it hurts. I cannot imagine digging out cattle buried alive in the snow, like the dairy farmers in New Mexico are right now. The task itself is daunting, but the emotional toll is immense. When disaster strikes, even something that’s completely out of our hands like a freak winter storm or massive disease outbreak, the impact reaches far more than our checkbooks. It is just as psychologically devastating as financially, but you won’t hear farmers talk about that very often. The farmers will pick up where they left off, do what they have to do, and continue on with their farms the way they always have. Interested in learning more about our turkey farm? Click here. The truth is, I cook a lot of turkey. But I don’t roast one very often. In fact, I’ve roasted a turkey exactly once in my life. But here’s the deal. It’s so easy, I promise I’ll be doing it again. That’s right – it’s actually easy to roast an amazing turkey. And you don’t even have to thaw it. Which makes the whole process a lot better. Without further ado, let’s cook this bird! Step 1: Buy a frozen, pre-brined turkey with a pop out thermometer. Step 2: Preheat the oven to 325 degrees. Step 3: Place the turkey in a shallow pan, on a rack. Step 4: Season with some salt, pepper, and your favorite poultry seasoning. Step 4: Roast for 50% longer than you would roast a thawed or fresh bird. Thawed turkeys should be roasted approximately 1 hour for every 4 pounds. Frozen turkeys should be roasted 1.5 hours for every 4 pounds. Step 5: Use a meat thermometer to check for done-ness (turkey should reach 165 degrees F throughout) and let the bird rest for at least 10 minutes before carving. A gorgeous, delicious turkey, with little fuss. Have questions? I encourage you to check out the Iowa Turkey Federation’s free guide to Thanksgiving turkey. And feel free to share my FREE non-fiction children’s book about our turkey farm. This month is the perfect time to read it! I love the classics. Anne of Green Gables and Little Women, and of course, Little House on the Prairie were my favorites as a child. Then in high school, it was Gone with the Wind. Strong female leads and a historical setting…I just couldn’t get enough. So it’s really quite surprising that I didn’t read Jane Austen until last summer. That’s right – it wasn’t until I was 30 years old that I read Pride and Prejudice. I have to admit, it took me a while to get into the book. The language was so different…I was out of practice and found it hard to understand. I found that watching the old BBC miniseries as I read helped immensely, and when I finished the book, I borrowed my sister-in-law’s copy of the Colin Firth version, and finally saw Mr. Darcy dripping wet, the scene I kept hearing about over and over. And I was hooked. I haven’t read any other Jane Austen books yet, but I’ve thoroughly enjoyed a few related pieces. This was billed as “Pride and Prejudice meets Downton Abbey” and it did not disappoint. It’s the story of one of the Bennet family’s servants, Sarah, and could definitely stand on its own. Although the fact that Pride and Prejudice is going on in the background adds another element of interest, and truly affects Sarah’s story, as well. I bought this for my sister-in-law for Christmas and then demanded that she let me borrow it. And I’m glad I did. Any other suggestions for an Austen fangirl like me? I firmly believe that it’s important to maintain a positive attitude. So instead of complaining about how busy I am, how tired I am, and how much I miss relaxing with my kids at home, I’m going to focus on the positive – the perks of going back to work full time. If you’re new here, you should know that I returned to work full time a month ago, after 5 years of part time work, part time stay-at-home-mom. I am now the social media manager for Iowa Corn, an organization that serves and represents Iowa corn farmers. 10. The people I meet. Every once in awhile, I meet someone interesting. Like this guy. It was kind of cool to turn around and see him at an event this weekend. He’s a graduate of the Iowa Corn leadership academy, not to mention a corn farmer. 9. The people I work with. As any stay-at-home moms know, it can be lonely if you don’t have a lot of adult interaction. Now, I work with 29 other people in our office, and many of them travelled to DC last week, too. Traveling with your co-workers is a great way to get to know them, and thankfully, so far I get along with all of them. 8. The places I go. I love seeing new cities, and I spent 5 days in Washington, DC last week. I had time to do a little sightseeing, but mostly, I dreamed about what it would be like to be Olivia Pope. 6. The behind-the-scenes access I get. As the social media manager, I was live-tweeting and taking pictures throughout the race. That meant I was on the track during the pre-race annoucements, and standing in pit row when they waved the green flag. I got to hang out in the media room, with all the official reporters, and I was waiting in Victory Lane when the race was over. I’m not a big race fan, but it was exciting to be so up-close and personal with the drivers and their teams. 5. The babysitters my kids hang out with all day. I can’t talk about my transition back to work without giving a shout-out to my amazing babysitters. The schedule is kind of crazy this year – I couldn’t find one person who could watch the boys all the time. So their time is split between my mom, Bart’s mom, and three high schoolers. And (sorry Grandmas) they LOVE the girls that watch them. And the girls do a great job. They take them to the park and to the pool, plan picnics and science experiments, and the boys love every single day with them. The girls have also been doing the dishes for me, since the boys are usually asleep when they get to our house, and I can’t tell you how amazing it is to come home to a clean kitchen! I also get to lead CommonGround in Iowa. After 4 years as a volunteer, I was really excited to take over the program for Iowa Corn. We have several events coming up this summer and fall, and are planning more for next year! 3. The difference I make. Last year, when I was part of the Ag-Urban Leadership Academy, I identified my mission in life. I know that sounds cheesy, but it’s true. My mission is to make a better world for my children and through my children. And my work in agriculture fits in to that mission perfectly. My children are the future of agriculture, and I truly believe that my work helps ensure that agriculture is on the right path for them and others. 2. The sense of accomplishment. Besides the fact that I truly believe my work is important, it’s also very satisfying. I like having an end product and measurable results. When I was a stay at home mom, I had very little of either. The work that I did everyday was important, and it was hard, but there was nothing concrete to show for it. If I cleaned the house or cooked great meals, I guess that was an accomplishment, but I turned around and did it all over again the next day. It was like treading water – yes, I was working hard, but there was no finish line, no shore to swim to. I like having a finish line, and many of the projects at work provide me with that sense of accomplishment that comes with a finished project. 1. The paycheck! Let’s face it, that’s a pretty big perk. I have to admit, I LOVE garage sales, but usually I’m the buyer, not the seller. In May, I reversed roles and actually had two garage sales of my own. I made over $1000 between the two sales, and got rid of multiple truckloads of furniture and “junk.” And of course, I learned a few lessons along the way. 1. Make AWESOME signs. And display them all over the neighborhood. 2. Hold your garage sale on Friday & Saturday. Friday afternoons are prime time for garage sales! 3. Location, location, location. The first garage sale was at my friend’s house in a really nice neighborhood in a larger town. And we had SO MANY SHOPPERS who were willing to pay a little bit more. The second garage sale was at my sister’s in a smaller town, and not only were there fewer shoppers, but they were thriftier, too. 4. Price things to sell (LOW!) Ask yourself what will make you feel better? Making a TON of money? Or getting rid of a TON of stuff? Both? Then price low! You’ll get rid of more and still make a amount of money! 5. Have lots of change on hand. Especially dollar bills. And if you have a lot of items that are a quarter, have quarters, too! I don’t think we used any dimes, nickels or pennies, though. 6. Use a notebook to keep track of sales. When you’re doing a sale with others (which I definitely recommend) you need to keep track of who sold what. We made columns in a notebook for each of us and just wrote down the amounts for each transaction. 7. Price everything or nothing. I suggest pricing everything, but I hate pricing things, so I usually end up with some priced and some not. An article I read suggested not pricing anything. That is very rare in our area, so maybe it is a regional thing. But I know that if you price some things and not others, you’re way more likely to sell the things that are marked! People just don’t (or won’t) ask for prices on things that aren’t marked. I think they believe that the unmarked goods just aren’t worth the effort (or price!) if they have to ask. 8. Advertise on Craigslist and your local Facebook swap groups. We posted some pictures on Facebook swap a few days before and made it very clear that we would not have any presales or sales through swap. We did not post prices or the address. The day of the sale, we updated the post with the address. 9. Have your garage sale early in the season. People are more excited for garage sales in the spring after a long, cold winter. Both of my garage sales were held BEFORE I started my #konmari process, so I may end up having another one before the snow flies! This month, we did Blogger Book Club a little differently. Instead of reading the SAME book, we all read a different self-help book. Because of my transition back to a full-time job, I chose The Life-Changing Magic of Tidying Up: The Japanese Art of Decluttering and Organizing by Marie Kondo (aka #konmari) with hopes that it would help me get organized before my new job began. And I’m happy to say that it worked. I began reading the book a few weeks ago, and as soon as I read the chapter on clothing, I started in. At first, I counted the items I discarded, but after getting rid of more than 200 articles of clothing (all mine! And not including socks or accessories) I lost count. But it doesn’t matter, because my bedroom and closet are the visual proof of my “tidying-up” and they bring me more joy than ever before. Next comes “papers” – I’m still working on that. #konmari is a process, one that may take months. But as the momentum builds, so does the joy. Marie Kondo’s positive attitude towards “tidying up” makes a huge difference in the process. By focusing on joy and thanksgiving, “tidying up” becomes something to look forward to. That’s important if you’re starting with a house as full of clutter as mine is. Kondo says, “I believe that tidying is a celebration.” I’m definitely celebrating the success I’ve had so far! I will admit, however, that some of Kondo’s suggestions seem a little wacky. For example, I don’t believe that my belongings or house will actually respond to my declarations of gratitude, but I do believe that my attitude may change because of them. I feel less guilt when I acknowledge an item’s purpose before discarding it, and thanking my house for providing me with shelter helps me keep things in perspective. Kondo suggests “tidying-up” by category, starting with clothing because it’s the easiest and leaving mementos for last, until you’ve really honed your “tidying-up” skills. One part of my clutter issue is toys, and the #konmari method doesn’t really address the issue. So I am waiting to tackle them. I want to work on my own clutter first, and model tidying-up for my boys before I ask them to help me tidy-up their toys. I plan to do more blog posts about my #konmari progress, so stay tuned! Now, be sure to check out the other Blogger Book Club book reviews. Remember, we all read different self-help books in June! And for July’s book: First Impressions: A Novel of Old Books, Unexpected Love, and Jane Austen by Charlie Lovett. The author is Kirby’s neighbor, and I am SO EXCITED to read this! For the past 5 years, I’ve been working part time, first as a Talented and Gifted teacher, then at The HomeShed, then for the Iowa Turkey Federation. 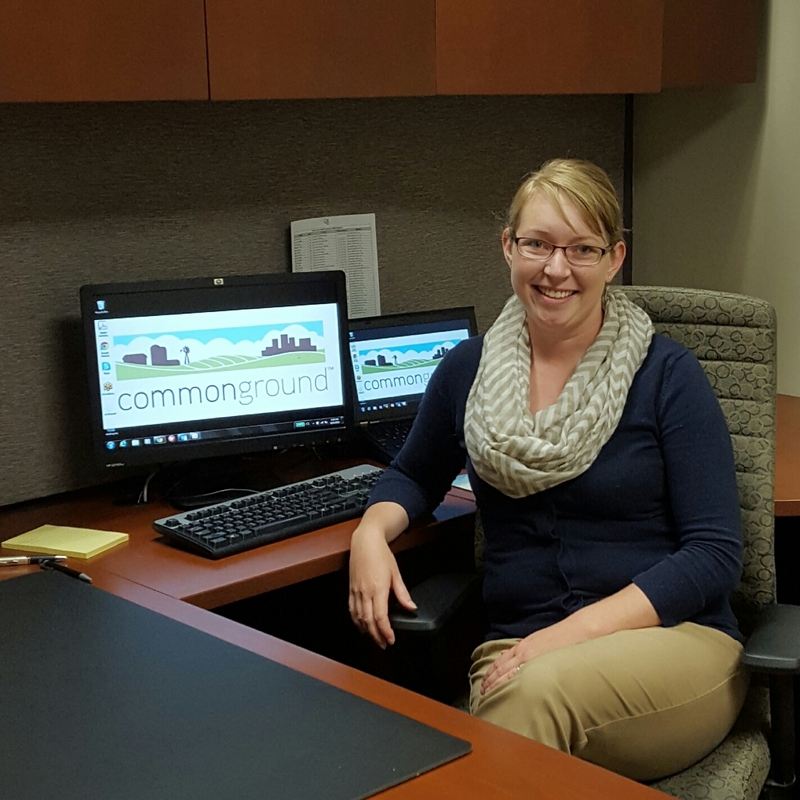 But this week, I started a new full-time job as social media manager for the Iowa Corn Growers Association. Working part time definitely had its perks, especially since my boys are young (4 and 6) and my husband is very busy with the farm. But there were a lot of factors that went in to my decision to “go back to work.” The biggest reason? This job is absolutely perfect for me. 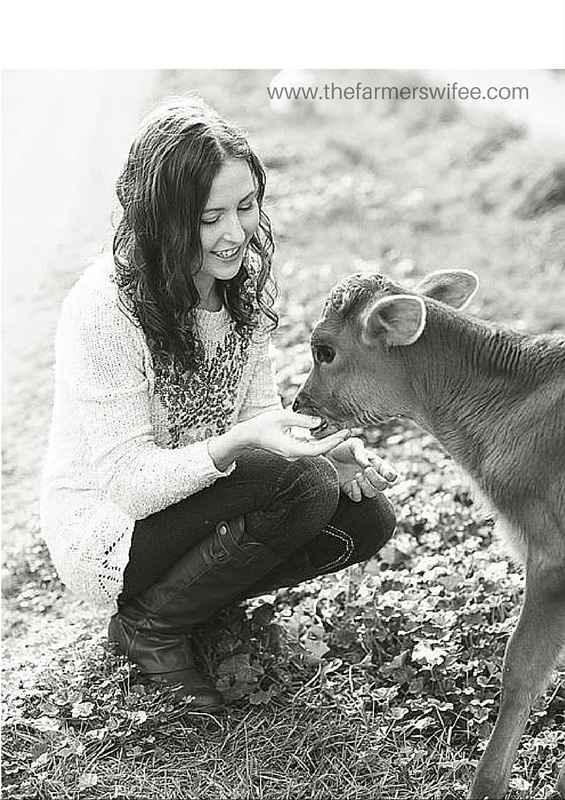 I’ve developed a passion for agriculture over the past few years, and as a blogger, I am a huge social media nerd. My new job allows me to combine both passions and do what I love everyday. I’m three days into my new job, and I can already tell that my new schedule will be a big adjustment for my family. But I’m also really excited for this new season in life. Any other working-outside-the-home mommas out there? Any tips for me? A few weeks ago. I shared my free, green weed barrier, and I mentioned that I used RoundUp in my garden. I am emailing her back personally, but I want to clear some things up here, too. But let me preface it by saying that I’m generally not scared of “chemicals.” And as a farmer, I actually have a high amount of a trust in the industry and the chemicals that are widely used by farmers. Of course, I know that other people have a different level of comfort with “chemicals.” (I put chemicals in parentheses because everything contains chemicals…water is a chemical, oxygen is a chemical…but most people think of chemicals as something artificial and scary.) And that’s okay. We all have different things that worry us. One of my friends only wears closed-toed shoes in grass because she’s afraid of spiders and snakes. One of my friends won’t let her children near large dogs. We all have our own things. Personally, RoundUp is not something I worry about. I use RoundUp (glyphosate) in my flower garden, around the sidewalk, and in the driveway. 1) The dose makes the poison. Most “chemical” exposure happens at very low levels. And, compared to other “chemicals,” glyphosate (RoundUp ) is only “slightly toxic.” (Caffeine, on the other hand, and copper sulfate, an organic compound used in organic production as a fungicide, are “very toxic.”) Click on the graphic for a more in depth explanation of toxicity & RoundUp . 3) “Chemicals” including glyphosate (RoundUp ) are subject to a LOT of research and strict standards for safety. Here is a blog post from my friend Jennie, a registered dietician and farmer in Maryland, about the organic and synthethic pesticides she uses on her crops. Ultimately, everyone will have a different comfort level with different risks and everyone can choose whether or not to use RoundUp in their gardens. If you’re not comfortable using it, then there are many other ways to get rid of weeds. I decided to take some pictures of my flower gardens as they are right now. They’re not perfect, and there are weeds. But it’s fun to see the gardens change over time, so I plan to do semi-regular “tours” of our landscape for you to see! On top of the wall, three more hostas, hydrangeas, and a juniper. Another view of the upper section in front of the bay window. This part of the garden is slightly more formal than the rest. The back row is made up of hydrangeas, then there are some new (little) barberry bushes, daylilies, and catmint. Speaking of catmint, it’s one of my favorite perennials. Drought tolerant, easy to divide, and keeps the deer away! What more could you want? This catmint is part of a small bed on the southwest corner of the yard. Last year, I had a small container herb garden over here, and I think that fluffy thing is a volunteer herb. Anyone know what it is? The north side…some pretty hostas, a hydrangea, a ninebark bush and a red twigged dogwood, then more hostas. Mini iris, two pulmonaria (there were supposed to be three, but one didn’t come back,) a couple of daylilies, and an arborvitae. And a vintage concrete turkey. Why not? I hope you enjoyed the garden tour. If you’d like to chime in about RoundUp , please follow the rules: Use Nice Words.